Welcome to BOS Github page. BOS official webpage with forums can be found at BOS. On this page I'll just provide a quickstart for how to try BOS. I'm basing this on OSX, but should be similar for *nix, and the repository has a .bat script for Windows. The image was created on my OSX setup with these commands, using the Homebrew brew install mtools package. Right now there isn't much you can do in BOS. 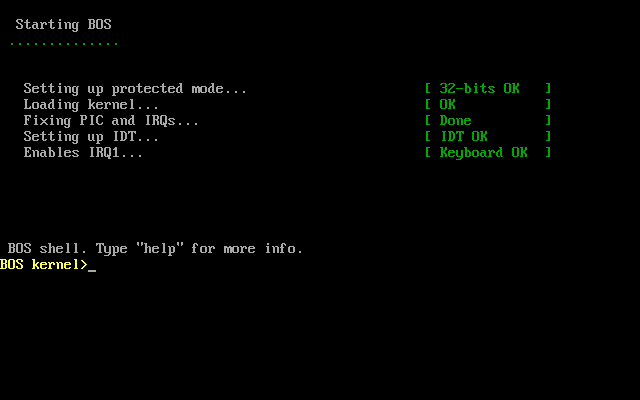 The available commands will be listed by typing help followed by ENTER. As development goes on, I will go into more detail here. After several years with not much happening, I'm now back and fully committed on getting the next version of BOS released - which will focus mainly on a VFS (Virtual File System) abstraction layer for keeping track of storgage devices and filesystems. Next release will feature the VFS with the updated floppy driver and FAT12 support. All contributions are welcomed. Be sure to visit the forums first, and announce what you might want to help out with, and then you create pull requests on Github. Having trouble? Check out the BOS forums at https://bos.asmhackers.net/forum and we’ll help you sort it out.